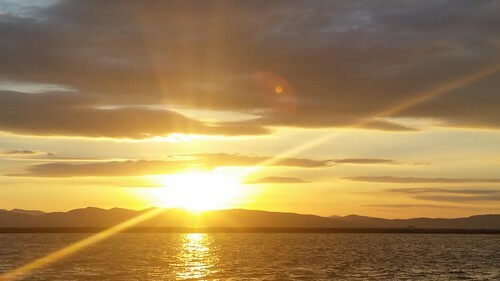 The sun setting over the mountains on the far side of Lake Champlain. Surrounded by scores of people, we watched this sun set beyond the lake. It wasn't as quiet and soulful as one would hope while watching such a beautiful event transpiring. There were plenty of people chatting, laughing, children-playing, etc and of course, everyone (myself included) with their phones out trying to capture the majestic. And can you blame them? It seems like a simple thing, the planet turns and there goes the sun. But to watch it transpire always feels magical. The colors, the clouds, and the angles are never quite the same, so you're watching an individual sunset that's been custom-fit for just that moment. I didn't take a lot of photos of this as I wanted to watch it directly much more than watch it through a device, but I did like this one with the sunstreak that runs from almost one corner to the other.